, a learned physician and mathematician, was born of a good family in Wales, and flourished in the reigns of Henry VIII., Edward VI., and Mary. There is no account of the exact time of his birth, though it must have been early in the sixteenth century, as he was entered of the university of Oxford about 1525, where he was elected fellow of All Souls college in 1531, being then B. A. but Wood is doubtful as to the degree of master. Making physic his profession, he went to Cambridge, where he was honoured with the degree of doctor in that faculty, in 1545, and highly esteemed by all that knew him for his great knowledge in several arts and sciences. 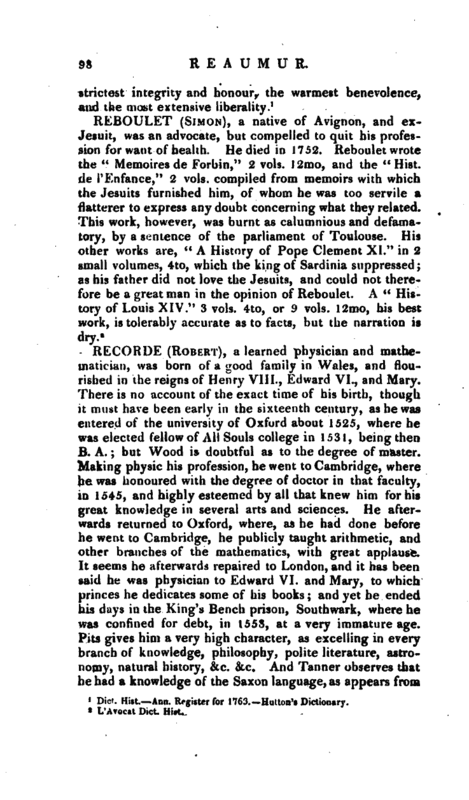 He afterwards returned to Oxford, where, as he had done before he went to Cambridge, he publicly taught arithmetic, and other branches of the mathematics, with great applause. It seems he afterwards repaired to London, and it has been said he was physician to Edward VI. and Mary, to which princes he dedicates some of his books; and yet he ended his days in the King’s Bench prison, Southwark, where he was confined for debt, in 155.S, at a very immature age. Pits gives him a very high character, as excelling in every branch of knowledge, philosophy, polite literature, astronomy, natural history, &c. &c. And Tanner observes that he had a knowledge of the Saxon language, as appears from | his marginal notes on Alexander Essebiens, a ms. in Corpus Christi college, Cambridge. Recorde published several mathematical books, which are mostly in dialogue, between the master and scholar. They are as follow: 1. “The Pathway to Knowledge, containing the first principles of Geometric, as they may moste aptly be applied unto practise, bothe for use of Instrumentes Geometricall and Astronomicall, and also for projection of Plattes much necessary for all sortes of men,” Lond. 1551 and 1574, 4to. 2. “The Ground of Arts, teaching the perfect worke and practice of Arithmeticke, both in whole numbers and fractions, after a more easie and exact forme then in former time hath beene set forth,” 1549, 1558, 1561, and 1571, 8vo. This work went through many other editions, and was corrected and augmented by several other persons; as first by the famous Dr. John Defe; then by John Mellis, a schoolmaster, 1590 and 1618; next by Robert Norton; then by Robert Hartwell, practitioner in mathematics, in London; and lastly, by R. C. and printed in 8vo, 1623. In the “Archaeologia,” vol. XIII. may be seen a specimen of the author’s method of illustrating an example, which exhibits a strange jumble of Arabic and Roman notation. The former was not much in use in his days. 3. “The Castle of Knowledge, containing the Explication of the Sphere bothe Celestiall and Materiall, and divers other things incident thereto. With sundry pleasaunt proofes and certaine newe demonstrations not written before in any vulgare woorkes,” Lond. 1551, 4to, 1556, fol. and 1596, 4to. 4. “The Whetstone of Witte, which is the seconde part of Arithmetike: containing the extraction of Rootes; the Cossike practise, with the rules of Equation: and the woorkes of Surde Nombers,” Lond. 1557, 4to. 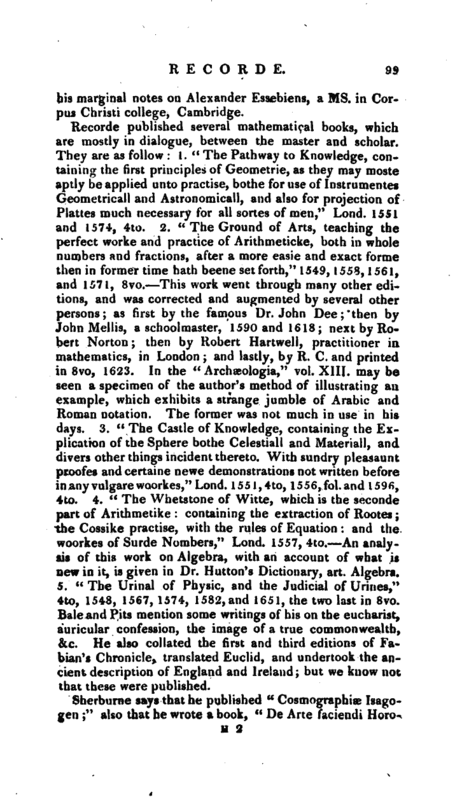 An analysis of this work on Algebra, with an account of what is new in it, is given in Dr. Hutton’s Dictionary, art. Algebra. 5. “The Urinal of Physic, and the Judicial of Urines,” 4to, 1548, 1567,1574, 1582, and 165 1, the two last in 8vo. Bale and Pits mention some writings of his on the eucharist, auricular confession, the image of a true commonwealth, &c. He also collated the first and third editions of Fabian’s Chronicle, translated Euclid, and undertook the ancient description of England and Ireland; but we know not that these were published. Tanner. Bale and Pits. —Ath. Ox. vol. I. new edit. —Hutton’s Dictionary. 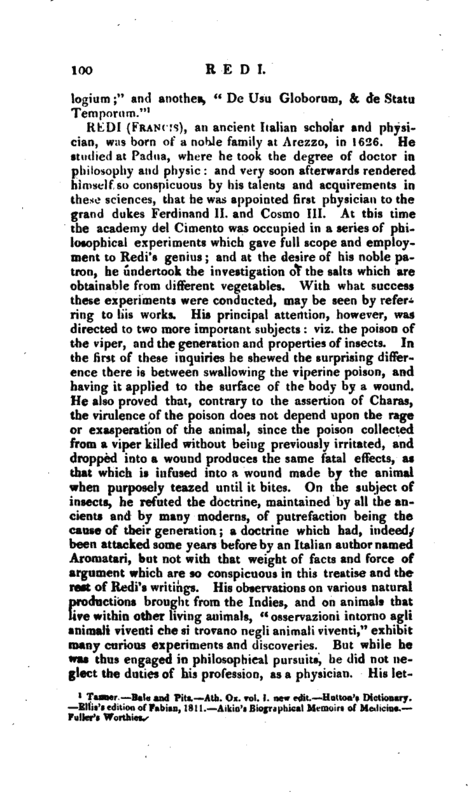 Ellis’s edition of Fabian, 1811. Aikin’s Biographical Memoirs of Medicine. Fuller’s Worthies.